ClubCoin Gereken: 200 Please note that, for now, you cannot download content from our platform directly onto a mobile device (phone, iPod, iPad, tablets...). You need to download your items onto a PC or Mac, and then transfer them onto your device in the normal way. We are working on allowing direct downloads to mobile devices but this is not possible in the current version of the platform. Sorry about the inconvenience! In June 1960, a young faculty wife named Alzada Kistner and her husband David, a promising entomologist, left their eighteen-month-old daughter in the care of relatives and began what was to be a four-month scientific expedition in the Belgian Congo. Three weeks after their arrival, the country was gripped by a violent revolution, trapping the Kistners in its midst. Despite having to find their wa… y out of numerous life-threatening situations, the Kistners were not to be dissuaded. An emergency airlift by the United States Air Force brought them to safety in Kenya where they continued their field work. Thus began three decades of adventures in science. 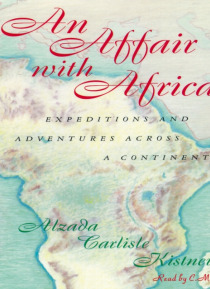 In An Affair with Africa, Alzada Kistner describes her family's African experience-the five expeditions they took beginning with the trip to the Belgian Congo in 1960 and ending in 1972-73 with a nine-month excursion across southern Africa. From hunching over columns of ants for hours on end while seven months pregnant to eating dinner next to Idi Amin, Kistner provides a lively and humor-filled account of the human side of scientific discovery. Her wonderfully detailed stories clearly show why, despite hardship and danger-and contrary to all of society's expectations-she could not forsake accompanying her husband on his expeditions, and, to this day, continues to find the world "e;endlessly beckoning, a lively bubbling cauldron of questions and intrigue. "e; In the spirit of Beryl Markham's West with the Night and Isak Dinesen's Out of Africa, An Affair with Africa shares with listeners the thoughts and experiences of a remarkable woman, one whose unquenchable thirst for adventure led her into a series of almost unimaginable situations. Listeners-from armchair travelers fascinated by stories of Africa to scientists familiar with the Kistners' work but unaware of the lengths to which they went to gather their data-will find An Affair with Africa a rare treasure.